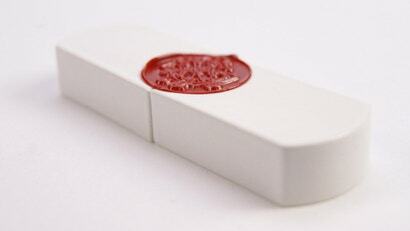 Wax seals have been used for millennia to guarantee a document's authenticity. If you got a letter with an intact seal, you could be assured that what you're reading was legit. The Top Secret USB does the same thing for your digital documents — literally. The Top Secret is a porcelain USB drive available in 2GB, 4GB or 8GB models. Its casing includes a small indentation where, once sensitive documents have been loaded onto the drive, a small amount of molten wax is poured and imprinted with an intricate design from the included metal stamp. Once the wax cools, there is no way to open the drive and access the files without breaking the seal — your recipient can be assured that they are receiving the unadulterated files. The Top Secret is currently available on its self-titled website and is available for $US46 (2GB), $US52 (4GB) and $US59 (8GB).